Leah's Crafty Life: Fairies, do you believe? So, I asked in my subject, Do you believe in Fairies? I sure do when it comes time for new Fairy releases with Some Odd Girl!! That's right, 3 brand new digital fairy releases this month and I'm the lucky girl who got to color them up. ahh, isn't she a sweetie? I added Ranger Liquid Pearls to her little berry piece in her hair, but they did this merge thing and well, it doesn't look as pretty as I had imagined, but she seems ok with it. I cut out the base of the card with Bazzill using my Cameo. Pattern papers are My Minds Eye, add more liquid pearls from Ranger, and some flowers from Prima, a Jillibean soup label for the sentiment, and this card is ready to mail. Fancy seeing the rest of the fairies in the shop early? Head on over to the Some Odd Girl blog to see what other beautiful creations were made with the ever so sweet, Pixie! Wish me luck, I head to the dentist this morning for a chipped tooth and to see about other unhappy things in store for my mouth. Love the soft seafoam green with the orange and pinks and great card base. Her eyes are a stunning amber just beautiful. Pretty, pretty! 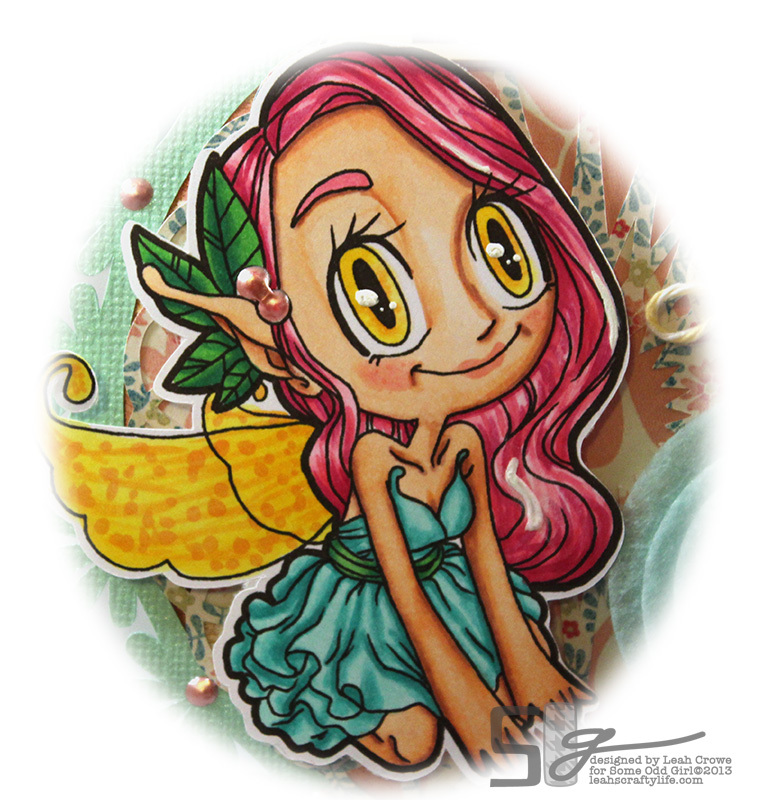 Such wonderful colors on this sweet fairy card! so pretty with the pink hair and the added texture to her wings...looks amazing.. So cuuuuute!! Great shaped card! This is totally adorable! Gorgeous! I really love the colors, so beautiful! This is a greata card and love the image - had to get it! Leah, she is beautiful! I love your shaped card and her shiny eyes! So gorgeous Leah. I love the sweet image, pretty colours and wonderful pretty detailing too. oooh... I totally LOVE this... ADORABLE!!! Perfect to show off Pixie!! I her hair sooo much!! Of course I believe in fairies!! They are the best!! I loveeeeeeeeee your card!! Soooooooooo beautiful!! I love love love the colors and loveeeeeeee the liquid pearls!!! omgsoh Leah this is just awwwwwwwesome hun! I love the little felt circley flower too! This card is so flippin awesome! Just everything about it!